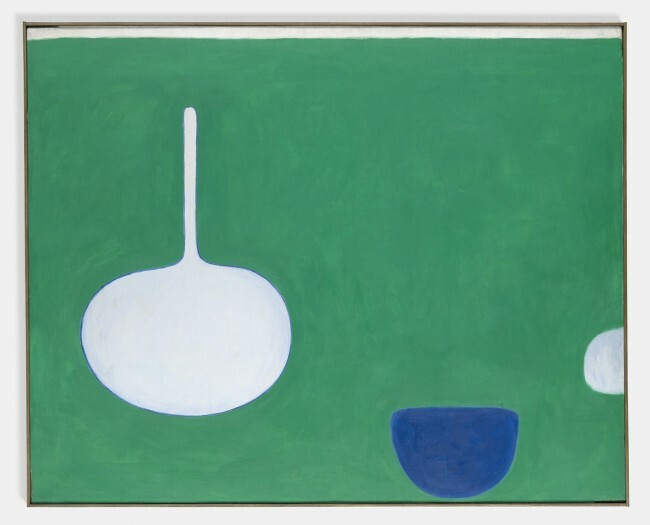 Green and Blue, 1971 is one of several paintings created by William Scott after 1965 in which he began to rework the familiar forms of pots, pans and cups into a new idiom. Between 1966-67 Scott produced several large-scale murals at various locations in Ireland including the Altnagelvin Hospital in Londonderry (below) and the Irish Television Centre just outside of Dublin. In these murals Scott reveals a more architectural approach to colour and develops a new approach to describing the sense of space in his pictures. Flat, simplified forms float in vast areas of plain, undifferentiated colour unencumbered by a composition that seemingly rejects a naturalistic approach to space and structure. This change in method undoubtedly influenced Scott’s approach to his smaller paintings and resulted in a group of works, in which the present painting is included, which share many formal concerns with the mural paintings. Green and Blue articulates a sense of scale far larger than its actual canvas size; a white frying pan, its form large and simplified and its contours defined by a thin line of blue floats in a sea of green. To the left, the smaller of the other two forms included in the composition, a white vessel of some kind, has been cut in half by the edge of the canvas. As such, it gives the impression that Scott has zoomed in on one area of the still life, either imagined or real, enlarging this detail to a monumental scale. In these later works, whilst forms have become simplified, pictorial space has become more complex. By the late 1950s Scott had dispensed with shadow and was deliberately distorting the relative scale of the objects within his pictures to undermine the illusion of a coherent perspectival recession. Consequently, the forms in his paintings appeared to be caught in a very shallow space, and to be stacked up one above the other. This sense of confined space was heightened by the large number of objects that Scott crammed into his paintings. However, around 1960 Scott began to reduce the number of objects in his paintings and, by the early seventies in works such like Green and Blue, he was down to including only a few vessels which punctuate the vast green of the picture plane. As the objects depicted lessened, the ground itself took on a greater significance and Scott began to change and develop the surface texture of his paintings. Around 1965, he abandoned the technique of using a knife to apply paint into a rich impasto onto the canvas and instead, applied it in thin washes of colour. As a result, the surface texture became much more even and flat and began to resemble the delicate, luminous work of his friend, the American artist Mark Rothko (1903-70). In Green and Blue, the ground is so flat that the luminous forms in white and blue seem to float above it, unanchored to the ground below.